If you have young children, one thing you may be looking to invest in is a balance bike. These bikes are ideal for young children, as they help them to learn balance and develop their steering skills. They provide a safe and stable means of increasing your child’s confidence and coordination skills. With balance bikes, there are no pedals for your child to have to focus on. This enables children to concentrate on steering and balance, which is the main goal of using one of these bikes. Many bikes are suitable for a broad age range such as 18 months through to 5 years but always check that your child's age fall within the range. The standard size is 12". Generally, the bigger the size, the bigger kid can ride the bike. Don't buy bikes with tires smaller than 12" because your child will outgrow them quickly. The height of a seat should be set such that the feet of your kid can be out flat on the ground. Since kids grow so fast, it's a good idea to buy a bike with adjustable seat height and change the height every 6 months. Steering limiters prevent sharp turns by blocking the handlebar movement. The locks limit the angle to 20-30 degrees in each direction. The idea is to avoid a jackknifing. Rear brakes help a kid to stop if they start to move too fast. Thick tires have a better grip on a rough terrain and help a child to keep a bike under control. Strider is a well-known name in this industry and offers a range of balance bikes for kids. One of these is the Strider 12 Sport Balance bike, which is suitable for ages 18 months to 5 years. With this balance bike, you can choose from a variety of cool colors that children will find attractive. The bike comes with a high-performance design, which is patented in the United States. Assembling the bike is simple and should take just 5 minutes, with all necessary tools provided. You also benefit from a 2-year factory warranty with this bike. In terms of features, this balance bike has flat-free EVA polymer tires, a footrest that is built into the frame, a one-piece ultra-light wheel set, and adjustable handlebars and seat. It also comes with a range of upgrades, including an XL seat post and an extra-padded seat. The banana-shaped frame is well constructed and solid. The bike has a lightweight structure and plenty of upgrades and updates included. 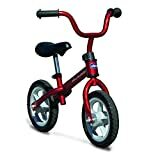 This balance bike is ideal for children aged between 2 and 4 years. Some of the upgrades that come with this balance bike include improved bearings, quick release seat bracket, upgraded seat, and a stronger metal headset. The bike also comes with upgraded handlebars. Although it is self-assembly, it is very easy to put together. You also benefit from EVA foam tires that are puncture resistant and never need to be inflated. 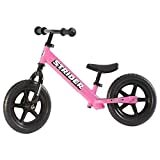 If you want the quality of a Strider bike but need something that is a little cheaper, the Classic model could be a good choice. This balance bike is geared towards those aged from 18 months to 3 years, so the age-range suitability is not as great as with the Sports bike. This bike is also available in a number of color options, so you can choose the one that will most appeal to your child. You get a 2-year warranty for additional peace of mind. You can also put the balance bike together quickly and easily, with the required tools included with your purchase. The bike is also very lightweight yet sturdy in build. Your child will be able to benefit from the integrated footrest that comes with the balance bike, as well as the adjustable seat and handlebars. You get EVA polymer tires with the Classic model along with ultra-light one-piece wheels. The seat is specially tailored for use by toddlers. This is a great starter balance bike to help your child learn balance and coordination. Available in a variety of colors, the Schwinn balance bike is competitively priced and solidly constructed. This bike boasts a range of features such as integrated footrests, an adjustable seat, and adjustable handlebars. It comes with air tubes and tires and has a foot-to-floor frame. This is a 12” balance bike, which is lightweight and fun for kids to use. The foot-to-floor design of the frame aims to provide your children with more confidence when learning about balance and coordination. Price wise, the Schwinn bike is very affordable compared to similar products. You will have to assemble the balance bike yourself, but there are very few parts and it is easy to put together. The adjustability of the seat and handlebars makes it both more comfortable and more practical. If you have more than one young child, you can simply make the necessary adjustments so that it can be used by multiple youngsters. This bike is also very sturdy, which makes it a popular choice with parents who are concerned about safety. This is a vibrant, solid balance bike that is designed to help your child learn to balance with greater speed and confidence. The bike comes with an ergonomic design, which means increased safety and comfort for your child. It is suitable for children aged 3 years and upwards. The seat and the handlebars are fully adjustable, so your child can enjoy maximum comfort when using it. It has soft tires and is very lightweight. The tires are puncture resistant, which also increases safety as well as helping parents to avoid the cost of puncture repairs. The seat is well padded, so your little one can sit comfortably. There are rubber handlebar grips for comfort and safety. The bike has received many favorable reviews from consumers. You can select from a great choice of vibrant colors when you purchase this balance bike for your child. This bike provides a safe and effective means of teaching your child about balance and coordination without spending a fortune. One unique feature of this bike is the simple step-in patented footrest, which provides greater ease and stability for your child. The footrest is designed to ensure the feet take their natural position when the child is coasting on the bike. In addition to this, the bike offers other benefits such as puncture-resistant EVA tires, which are maintenance free and will not require air. The bike is suitable for children aged up to 5 years and comes with an adjustable seat and handlebars so you can make adjustments based on the age and height of your child. This plastic tricycle is an ideal option for small toddlers, and it is available at a low cost. The tricycle is designed for youngsters aged from 1 to 4 years. It is very lightweight and easy to carry, and its three wheels provide extra stability for children. This is perfect if your child lacks the confidence to use a 2-wheel balance bike to train on. The tricycle is foldable, which means that you can carry, transport, and store it with total ease and convenience. Its construction and materials make it ideal for both outdoor and indoor use. 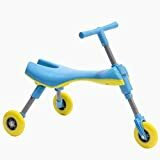 It comes in a pleasant powder blue color with vibrant yellow wheels. It also has a sturdy, yet comfortable seat. Another key point to consider is that this product requires no assembly at all, as it comes fully assembled and ready to use. The UltraLite balance bike from Cruzee is extremely lightweight. In fact, it is the lightest balance bike available, weighing just 4.4 lbs. This makes it ideal for carrying around or transporting on trips. You can also choose from a wide variety of bold colors to suit the preferences of your child. This balance bike is made from rust-free anodized aluminum. While the cost is higher than average, you do benefit from plenty of features. The bike comes with comfortable grips, a padded seat for extra comfort, flat-free foam rubber tires, and an adjustable seat and handlebars. In addition to this, you can benefit from a lifetime warranty, which means greater peace of mind. The sturdy design of this balance bike is designed to help children aged from 18 months to 5 years. The balance bike will help your child to learn about balance and coordination in comfort and safety. There are even low-profile axle bolts on the bike, which will help to prevent ankle injuries. This stylish balance bike, from reputable manufacturer Strider, is ideal for children aged between 18 months and 5 years. The bike has a sturdy but lightweight design and comes with various safety and comfort features. It has a lightweight aluminum frame, a range of upgrades compared to the Classic, a 2-year warranty, and it even has its own number plates. The padded seat has been improved to further enhance comfort, and both the seat and handlebars can be adjusted. You will pay a little more than average for this bike, but you are paying for quality, great design, and improved comfort. If you want something that offers affordability, simplicity, and a fun design, this balance bike provides an ideal solution. The product is designed to teach coordination, balance, and steering to your child. It comes in a metallic blue color and one of its unique features is that all materials used in its construction are eco-friendly. This balance bike is designed for use by children aged between 18 months and 5 years. It comes with a variety of safety features to keep your child protected. This includes air-free EVA foam tires, non-toxic materials, and protective casing on screws to help prevent injury. You child can also look forward to comfort with padded seating and a fully adjustable seat and handlebars. Your child can make an easier transition to a pedal bike after training with this product. The bike even has a brake level so your child can practice braking. Although you do have to assemble the bike yourself, there is minimal assembly required and the process is very simple. This is a very lightweight balance bike that weighs in at just 8 lbs. Designed for use by children aged between 2 and 5. The bike comes with a very comfortable, ergonomic saddle and this can be easily adjusted to suit your needs. Your child can also get used to braking, with the adjustable reach brake lever that is integrated into the design. The handlebars are made from high-quality aluminum and have premium grips for increased safety and comfort. Safety is also enhanced by the reflective dots on the high quality inflated tires. A high-end balance bike with a huge range of benefits, this product is an excellent choice if you can afford to pay more for your child’s bike. You can choose from a variety of cool colors with this balance bike, so you can choose the one that you feel will most appeal to your child. This balance bike is suited to children aged from 18 months to 4 years. It has a very lightweight aluminum frame and has been designed to optimize when it comes to balancing. It also has an upright seat to help improve balance, as well as a steering lock limiter. Other features that you can benefit from with this balance bike include easy reach V brakes, geometric design, alloy rims, and comfortable seating. A fun, eye-catching, and stylish balance bike, this is a product suited to little ones aged 18 months and upwards, to a maximum weight of 55 lbs. The bike boasts a lightweight frame made from quality aluminum. Its lightweight construction makes it easier for your child to control and you can choose from a number of different colors for the frame. This bike comes with an adjustable seat to suit the needs of your child. You also get high- quality 12-inch pneumatic refillable tires for a smoother ride. These tires are wider than average, which means that your child can benefit from improved stability. They are also extra durable, so they outlast standard tires on many other balance bikes. Weighing just 8.75 lbs., this balance bike has won various design awards. The cost of the bike is higher than average, but it still represents excellent value given the quality and design of the product.